WHAT IS IT? 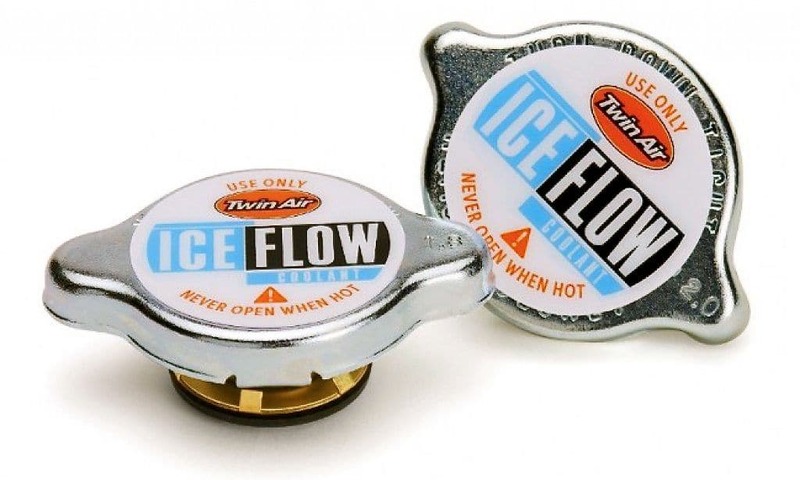 Twin Air’s Ice Flow radiator cap increases the boiling point of the water in your bike’s radiator by increasing the amount of pressure inside the radiator. The difference between a stock radiator cap and a high-pressure one is dramatic. WHAT STANDS OUT? 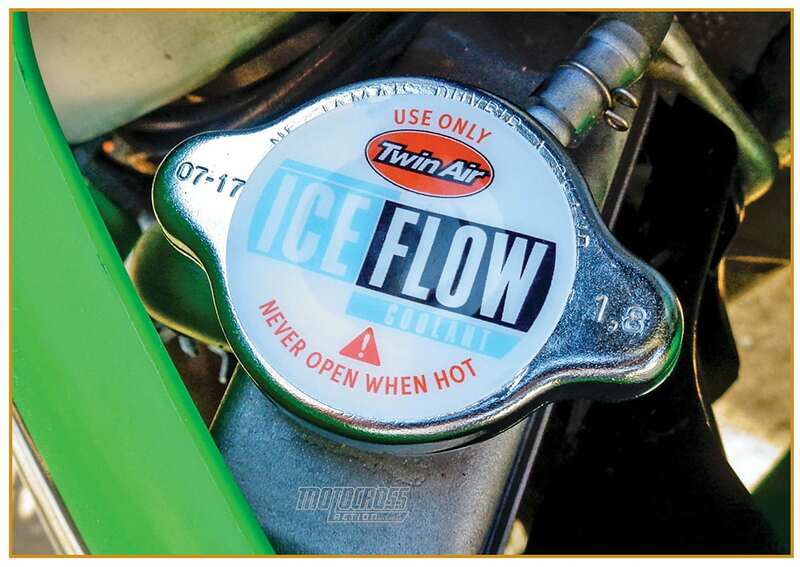 Here’s a list of things that stand out with the Twin Air Ice Flow high-pressure radiator cap. (1) Concept. A motorcycle’s radiator cap is similar to the safety valve found on a chef’s pressure cooker. Since the boiling point of water increases when the water is placed under pressure, a radiator cap has a coil spring situated between two rubber seals. The stiffness of the spring determines how much pressure the water is under. As the water heats up, it expands. This expansion puts pressure on the radiator cap’s spring. When the radiator’s internal pressure exceeds the spring rate of the radiator cap, the hot coolant escapes and overflows between the two rubber seals. But, until the spring’s tension is overcome, the water will not boil. (2) Temperature control. Without any pressure on it, water will boil at 212 degrees Fahrenheit (at standard temperature and barometric pressure); however, a cooling system that is under 15 pounds of pressure will allow straight water to reach 250 degrees before it boils. For every pound of pressure exerted on the coolant, the static boiling point is raised by 3 degrees. (3) Measurement. There are many measurements of pressure. Most radiators use kilograms per centimeter squared (kg/cm2). American cars use pounds per square inch (psi). Scientists use kilopascals (kPa) and Europeans use barometric pressure (bar). (4) Stock caps. Most Japanese bikes come with 1.1 kg/mm2 radiator caps, while KTMs and Huskys come with 1.8 kg/mm2 caps. A 1.1 kg/mm2 cap can handle 14.22 psi before the coolant pushes the valve open and steam comes out the overflow. By increasing the radiator cap to 1.8 kg/mm2, the radiator can handle 25.6 psi, while a 2.0 kg/mm2 cap ups the ante to 28.45 pounds. The higher the pressure, the longer the water in your radiator will resist boiling. (5) Function. Twin Air offers 1.8 radiator caps to replace the stock 1.1 caps on Hondas, Yamahas, Kawasakis and Suzukis. For KTMs and Husqvarnas, which come stock with 1.8 caps, they have a 2.0 cap, which is 176 kPa, 1.96 bar and 28.45 psi. WHAT’S THE SQUAWK? MXA always runs higher-pressure radiator caps; it’s foolish not to.